Indiana Governor Mike Pence campaigned for Republican presidential nominee Donald Trump at an event in Rochester, New Hampshire, on Sunday. It's the latest in a series of visits by Trump and Pence in recent weeks. Trump was just in New Hampshire and Maine on Friday. Democratic nominee Hillary Clinton was in the Granite State last Monday. 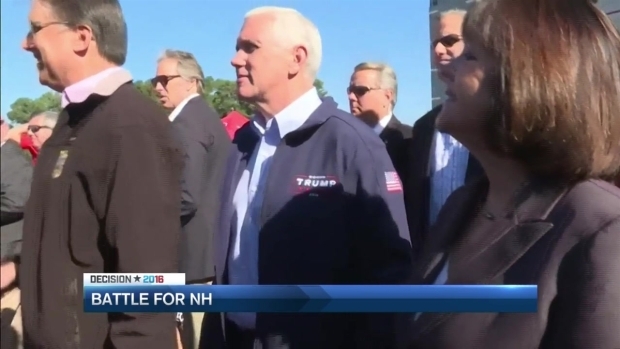 Following a rally at the Governor's Inn, necn spoke one on one with Pence who is still trying to win over undecided voters. "We are just encouraging Independents, Democrats and every republican to come along the Trump-Pence team," Pence said. The latest polls show Clinton ahead in New Hampshire and her supporters have also been campaigning hard for votes in the Granite State. But Trump and some of his supporters say they don't believe the numbers. "I don't think everyone is honest when they get called because sometimes when saying you're for Trump, you know, it's tough," said Trump supporter, Carolyn Vail, of Berwick, Maine. The expanded FBI investigation into Clinton's emails was a crowd-pleasing talking point but Pence says it's not a smoking gun. "I believe what we already know about Hillary Clinton's years of secretary state while she was managing our foreign policy she had a private family organization and the existence of a private sever the contents of which have been coming out and show a pay to play style of politics the American people are tired of," Pence said. But it's these late in the game developments that some undecided voters are waiting for. "There's still news coming out that could affect their opinion and that concerns me and because of that I'll leave it up to the last minute," said voter Mike Castaldo, of Dover, New Hampshire. Sen. Kelly Ayotte of New Hampshire is one of the Republicans that says she will not vote for Trump and plans on writing in Pence's name.